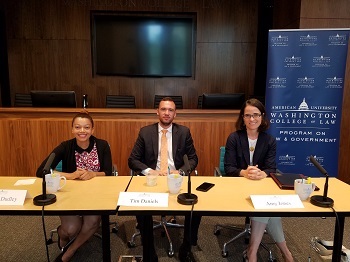 On Aug. 14, 2017, as part of Orientation Week, the Program on Law and Government and the AUWCL Chapters of the American Constitution Society, the Federalist Society, and the National Lawyers Guild organized a panel presentation for incoming 1Ls featuring alumni currently working in the House of Representatives and the Senate. 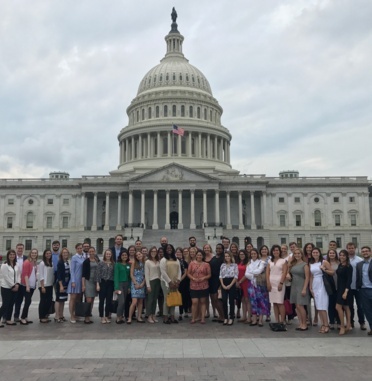 The program was followed by an afternoon tour of the U.S. Capitol. The alumni speakers Lauren Dudley '12 (Law & Government LL.M. ’13), Counsel, U.S. Senate Permanent Subcommittee on Investigations, Tim Daniels '13, Legislative Director for Representative Andy Harris (MD), and Amy Jones '03, Education Policy Director, U.S. House of Representatives Committee on Education & the Workforce, spoke to a group of more than 50 incoming 1Ls about their positions and working on the Hill. They also answered questions and offered advice about what these new law students can do during their first year of law school and beyond to prepare for a career in government. The students learned a bit about the difference between working for a congressional office and a committee. But some practical skills were also discussed – all three panelists said Legal Writing is one of the most important first year courses.